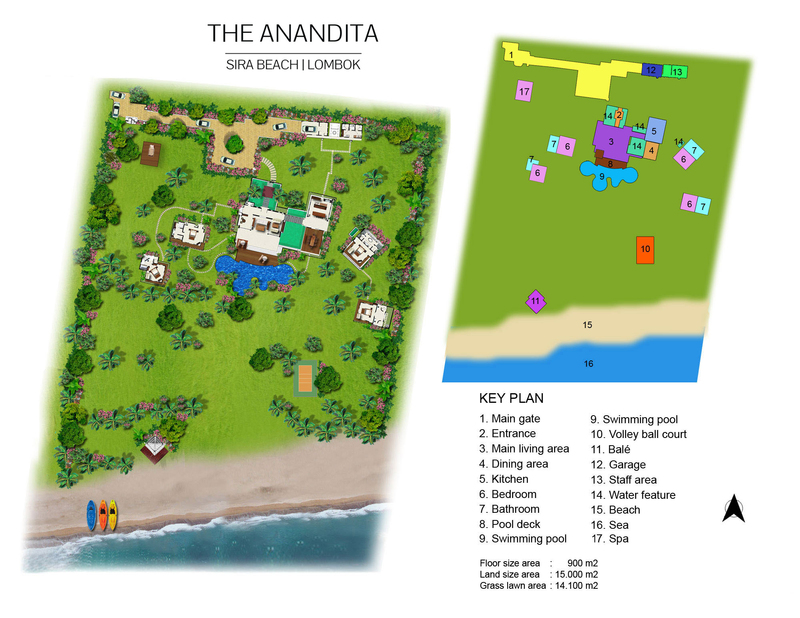 The Anandita is approached by a private driveway, which leads into a secure parking area. A grand porte cochere, bordered by a lily pond, heralds the entrance to the villa’s main pavilion via a pair of impressive wooden doors. From here, a colonnaded walkway sheltered by a glass-roofed pergola leads over the lily pond to the kitchen and the dining pavilion. The four standalone sleeping pavilions are positioned in the garden, well away from the main pavilion. The expansive, fan-cooled living room at The Anandita has a high roof and presents three distinct, yet integrated areas. The central section is distinguished with a Palimanan frieze featuring carvings of birds, frogs, dragonflies, leaves and flowers, and flanking a stone floor that extends directly onto the pool deck through wide, folding glass doors. This area is furnished with two comfortable sofas strewn with playfully coloured scatter cushions, a chair and a rustic coffee table. The remainder of the room is slightly elevated with a polished wood floor that extends around the central sitting area in a U-shape. On one side is a more formal sitting area with segmented upholstered sofas, chairs and a flat screen TV–DVD player with Apple TV box allowing guests to access movies on Apple TV or their own accounts on Netflix and YouTube. The third area presents a billiard table, desk, bookshelves and guest washroom. The Anandita’s splendid dining pavilion is open on four sides under a soaring roof. Cooled by ceiling fans, the dining area is screened from the guest kitchen by attractive fretwork timber panels; one of the walls is graced with a collage featuring Thai elephants, while a Buddha’s-head statue guards the opposite side. Here, guests will be serenaded by the sounds of water-in-motion, charmed by the sight of dragonflies hovering around the fishpond, and captivated by the gorgeous views. A grand dining table for 12 takes centre stage in the pavilion with views through rows of coconut palms in the garden and onwards to the beach and ocean. The front section of Anandita’s modern kitchen is well equipped for guest use, with a fridge, coffee machine and plenty of quality tableware and glassware. It also features a built-in breakfast bar furnished with ten chairs. The main staff kitchen is hidden behind a screen wall and is fully equipped with everything that the cook needs to prepare delicious meals. The Anandita boasts a multi-tiered pool deck crafted in both Palimanan stone and timber boards. Here, three tall coconut trees and two frangipani trees offer dappled shade. The main level is furnished with two wooden tables and chairs, each offering a place for casual dining or socialising. An elevated timber deck is furnished with two sunbeds and an umbrella for daytime lounging, plus a table and chairs for a romantic candlelit dinner. Meanwhile, four wide stone steps lead down to another timber deck at pool level, offering more sunbeds and umbrellas. The free-form swimming pool is evocative of a jungle glade with a whirlpool hidden within a circular section. Like a small lagoon, the water wends its way through the garden, bordered by flowering shrubs and trees, river boulders and bushy palms. The huge manicured lawn stretches all the way down to the beach, a volleyball court is positioned between the palm trees, and a line of sunbeds and umbrellas rest beside the white-sand beach. Elevated just above the beach is a large balé (relaxation pavilion), complete with a telephone for summoning refreshments. This is a great spot for a massage and perfect for contemplating Lombok’s mysterious Mount Rinjani and watching the sunset over Bali’s Mount Agung. There is also a table here for casual lunches or romantic dinners. The beach is lapped by clear waters, shallow and safe for swimming. The Anandita’s four bedrooms are housed in individual pavilions which are arranged in pairs but spaced well apart for privacy. Although the pavilions are similar, each is styled with its own bold colour scheme and artwork, complemented by a dressing area and a sumptuous ensuite bathroom. A pair of Anandita’s signature orange sunbeds and a matching umbrella offer peaceful spots for relaxation in front of each pavilion. Flaunting a dark blue colour scheme, bedroom 1 is furnished with a king-size bed, and is blessed with views of the garden and the sea beyond. The ensuite bathroom has a standing monsoon shower and the additional luxury of an oversized soaking tub. Please note this is the only bedroom without the provision of a DVD player. Bedroom 2 is furnished with a king-size bed accented with bright orange cushions and equipped with a DVD player. Glass walls on three sides offer delightful views of the garden and the sea. The semi-open-air ensuite bathroom is fitted with a standing monsoon shower and the additional luxury of an oversized soaking tub. Bedroom 3 is furnished with a king-size bed, equipped with a DVD player and blessed with views of the garden and the sea beyond. This room’s ensuite is fitted with a standing monsoon shower. Deep red Bedroom 4 is the smallest of the sleeping pavilions, but it is nevertheless furnished with a king-size bed angled to face the sea and equipped with a DVD player. The charming open-air bathroom is fitted with a bathtub and monsoon shower.